Bloomsbury Children's Books, 9781681198156, 224pp. Fans of E. D. Baker's The Frog Princess, rejoice! Fifteen years after the original, Princess Emma, Prince Eadric, and all the beloved characters are back for another magical adventure from popular author E. D. Baker. Two weeks after Emma's birthday, Prince Eadric -- having been turned from a frog into a human again -- is still in Greater Greensward. One day, a beautiful princess named Adara arrives at the castle in Greater Greensward for a visit, claiming to be Emma's distant cousin. But Adara has other motives that threaten Emma and Eadric's blossoming romance. Meanwhile, something is very wrong in Greater Greensward. Crops are dying, streams are drying up, and large sections of trees in the enchanted forest are withering -- all because the Fairy Queen has disappeared. Without her, there is no peace in the magical kingdom, and dangerous foes threaten to take advantage of her absence. Only brave, tenacious Emma with her knowledge of the land can restore order . . . but first she must set out on a journey unlike any before. 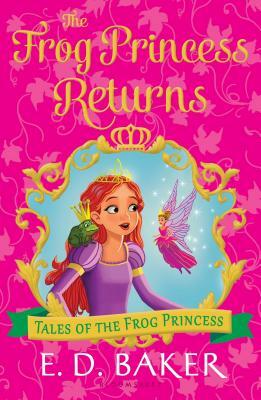 Brimming with lovable characters and page-turning magic, The Frog Princess Returns will bring a whole new batch of readers to E. D. Baker's highly acclaimed, wonderfully popular world of the Frog Princess series. E.D. Baker is the author of the Tales of the Frog Princess series, The Wide-Awake Princess series, The Fairy-Tale Matchmaker series, and many other delightful books for young readers, including A Question of Magic, Fairy Wings, and Fairy Lies. The Frog Princess was the inspiration for Disney's hit movie The Princess and the Frog. She lives with her family and their many animals in Maryland.